A new way of experiencing football, food and fashion. In the center of Florence, in Piazza Strozzi a new place where these three Italian excellences find their synthesis in an original and fun fusion. A place to follow all the football matches live with friends, with an excellent restaurant that focuses on traditional Italian and local products, an ideal lounge bar for every moment of the day, from breakfast to aperitif and evening drinks. an exclusive shop where you can buy the original FFB garments for a perfect sportstyle and to finish a play area where you can challenge your friends in exciting games of football, just like those on TV to never forget that football is friendship, sharing and love for sport. 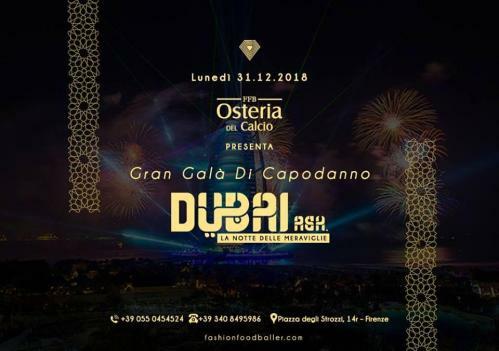 FFB - Osteria del Calcio presents the DUBAI ASH "The night of wonders"
Shows with belly dancers and hookahs.